In the heart of any big city, you will find the ethnic diversity that makes up America. The Twin Cities of Saint Paul and Minneapolis, Minnesota, are no exception to that rule. First time visitors to our region can get overwhelmed by the numerous cultures. However, if you really want to know what makes America great, head north on highway 35. Highway 35 is a 150-mile stretch that ends in Duluth; a port town located at the base of Lake Superior. This stretch of road continues up the north shore of this great lake and on into Canada. This scenic path is quite stunning and those who travel it instantly fall in love with everything it has to offer. Nonetheless, we are going to focus on this stretch between St. Paul and Duluth. It is unclear as to how many off ramps there are on this 150-mile stretch, nonetheless, there are multitudes to choose from. Each of them consists of a path that will lead you to rural Minnesota, including an area known as the Iron Range. The Iron Range is a vast territory located in northern Minnesota. The state’s iron ore was mistakably discovered during the gold rush. Many miners were heading west to discover gold, and the iron was ignored. Unbeknownst to the miners, the iron would become more valuable to northern Minnesota than the gold. This mammoth region is comprised of three iron ranges that were discovered at different times. The first ore was shipped from the Vermilion Range in 1884, then the Mesabi Range in 1892 and the Cuyuna Range in 1911. Only the Mesabi Range is still mined today. The Iron Range as well as the many other towns that surround the area is filled with hard working, blue-collar workers. Any country music entertainer, who has traveled the roads of the United States, will always tell you that the real heart of America is found in the small towns in areas like the Iron Range. America was built with the labor of hard working people, like the miners in Minnesota. The blue-collar workers, like those of northern Minnesota, are the heart and soul of America. Unless you have traveled to places like the Iron Range and Duluth, you will not experience the core of America. It takes the residents of small towns, like Two Harbors, Minnesota, to create the character and essence that truly is the American spirit. It is the people, that make America, but it is also the land. What makes America so unique? Each corner of this great land has something extraordinary and unimaginable to offer from all other areas of the world. It is the entertainers, who have traveled from sea to shining sea, that have captured our interests in America within their songs. So many great songwriters and entertainers have poetically collected the spirit of America in songs that have been labeled Patriotic. The origins of patriotic music are found prior to America’s independence as it was aligned with the British political ambitions for the new land. Nonetheless, some scholars tribute the origins to six main wars; the American Revolution, the American Indian Wars, the War of 1812, the Mexican-American War, the Civil War and the Spanish-American War. History books do not dictate which song was the first patriotic song in America. Nonetheless, in 1768, founding father John Dickinson’s song called “The Liberty Song” has claim to being the first American patriotic song. This was the first time that we heard the statement “by uniting we stand, by dividing we fall” in American history. In 1814, Francis Scott Key wrote a poem called “Defense of Fort McHenry,” after witnessing the attacks at Fort McHenry in the Chesapeake Bay during the War of 1812. Later the lyrics were set to music common to British and American sailors. One hundred and seventeen years later, in 1931, his song “The Star-Spangled Banner” earned the title of the United States’ official national anthem. Throughout America’s first battles, many songs came forth. Songs like “My Country, ‘Tis of Thee” in 1831 and “America The Beautiful” in 1882. The Civil War brought many songs including notables like “Battle Hymn of The Republic,” “Dixie,” “The Washington Post March,” and John Philip Sousa’s “The Stars And Stripes Forever.” As America continued to develope, songs like “Over There” and “Yankee Doodle Dandy” came about during World War I. In 1918, Irving Berlin composed “God Bless America,” which is often mistaken as the national anthem. Composer Woody Guthrie disliked Berlin’s song as he called it unrealistic and complacent. In 1940, Guthrie wrote “This Land Is Your Land,” as an answer to his disgust over Berlin’s song. Any one who has grown up in America has learned these songs and has sung them in some sort of capacity. Covers of these songs have been recorded by many entertainers in country music, while giving them new life. Conceivably the best cover version is LeAnn Rimes’ “God Bless America” from her 1997 album You Light Up My Life. As the case may be, American’s would claim that Lee Greenwood’s “God Bless The USA” as the most popular of patriotic songs. "I can remember as a young boy watching a parade in my home town of Sacramento, California. I loved the pageantry, the clowns, the floats, the marching bands - but most of all I loved the soldiers marching by in perfect formation and the cadence that kept them in step. Later, when I was in High school, I would play snare drum in the drum and bugle corps for the local American Legion post, in the same parade." shares Lee Greenwood. "I left home after graduating high school and went to work in Nevada. In my twenty years in Nevada, there was always something that kept reminding me that our country needed inspiration. I never lost the passion to use my music as a way to unite us all. After signing with MCA in Nashville, I would move to Tennessee and realize my goal of becoming a success as an entertainer and recording artist. I toured 300 days the first two years and discovered what I already knew. America was vast & diverse, but Americans were pretty much all the same. In 1983 I finally wrote the song that would change my life and bring us together as a country - again." Throughout country music, we see plenty of patriotic songs. Several entertainers have taken their American pride to the next step by recording albums filled with patriotic music. Charlie Daniels is no stranger to American pride. As an avid supporter of the troops, Daniels has lent his talents to numerous projects to help support our Nation’s military. In 2010, Daniels released his album Land That I Love. The album features fifteen patriotic style songs; among them, you will find “Red Skeleton’s Pledge of Allegiance.” Performed as a recitation, Charlie reiterates the true meaning behind the “Pledge” that was once stated by Mr. Skeleton on his show. Mr. Daniels also includes a beautiful instrumental version of “Star Spangled Banner.” Nonetheless, it is the opening song “My Beautiful America” that poetically captures the positive side of the American countryside. Another notable song to raise your American spirit is “’Merica.” Written by Corey Justin Crowder, Benjamin Curtis Caver and Nicole Marie Witt; this song was recorded by Kenny Rogers for his 2013 album You Can’t Make Old Friends. When you don't say "yes, ma’am"
Mr. Rogers is an avid photographer. In his travels across the nation, he has taken time to photograph the best that this land has to offer. Today, he continues to share his photographs and others on his official Facebook page. Another group of talented musicians known for their patriotism are the four men who make up The Highwaymen. Johnny Cash, Willie Nelson, Waylon Jennings and Kris Kristofferson teamed up to create this group in 1985 and were active until 1995. The four recorded three albums together. Among those albums, we can find “American Remains.” This song gives the listener a historic approach of four characters in America. All four entertainers went on to record other single patriotic songs. Willie Nelson speaks about American dreams in “Livin’ In The Promise Land.” On September 20, 1984, Waylon Jennings recorded his song “America.” Nonetheless, the most patriotic single recorded by one of the members of this quartette would have to be “Ragged Old Flag” by Johnny Cash. 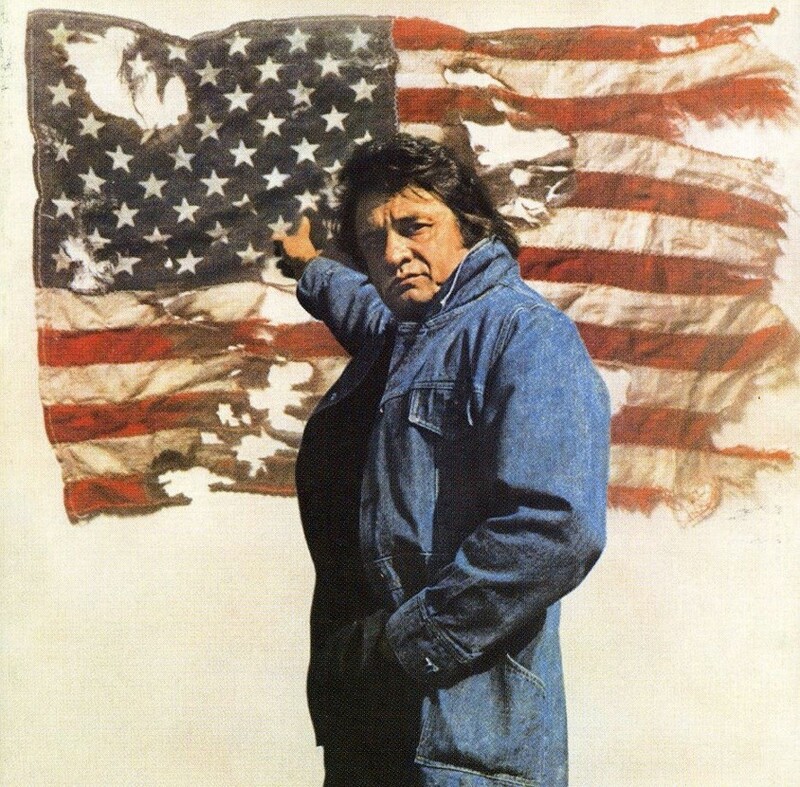 In 1974, Johnny Cash wrote and released “Ragged Old Flag” as the title cut from his forty-seventh album, which included several other political and ethical songs. Forty-three years later, Charlie Daniels would record his version of the song and release it as a single. It’s just a little story of an American family. Added to our list is a great song recorded by Aaron Tippin called “Where The Stars And Stripes And The Eagles Fly.” Tippin co-wrote this song with Kenny Beard and Casey Beathard for his 2000 album People Like Us. However, the song did not make the cut. Tippin is quoted as saying “But now, I know exactly why it didn’t. It had a bigger purpose.” Tippin went on to record the song two days after the September 11th attacks. The song was released on September 17, 2001, to rave reviews. Further more, Tippin donated all the proceeds from the single to the Red Cross and its relief efforts for the families of the 9/11 attacks. According to Randy Goodman, the then President of Lyric Street Records, the single raised approximately $250,000. In 2004, Sony Music released a series of three albums called Patriotic Country. These three albums featured a combined total of fifty-two songs. Each of the songs contained a common theme of patriotism with respect and pride for our troops. Nonetheless, the many of the songs lacked the over all theme. Through the years, we have heard a wide variety of patriotic songs in country music. Some are dedicated to the soldiers, which we label Songs For Soldiers. Other songs that can fall into the category of patriotic songs also fall under Songs of Remembrance of September 11th. You can see all of these lists of songs on our website. When we go back and look at all of the patriotic songs in country music, the best ones are those that were written and or recorded prior to 1990s. Why is this? Perhaps, it is because the songwriters and entertainers, who perform these songs, remember the true spirit that America is built on. If you are in our neck of the northwoods, journey up highway 35. It’s a beautiful drive that presents to you the wildlife scenery and communities filled with down home, hard working people. This stretch of land is just one piece of the puzzle that makes America so remarkable.